Heat has long been the enemy of solar cells — high temperatures can cook a cell and causes it to lose efficiencies and mos cells aren’t set up to take advantage of the heat produced during electricity generation. But a group of Stanford researchers have figured out a way to take advantage of both light and heat in generating electricity via a solar system. 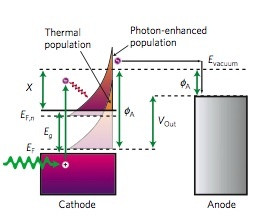 The research, published in Nature Materials this weekend, shows off a process called the “photon enhanced thermionic emissions (PETE)” that can make a solar cell convert light into electricity and also capture the heat for the same purpose. Calculations by the researchers, led by materials science professor Nick Melosh, show that a PETE solar device could help convert more than 50 percent of the sunlight and heat into electricity under concentration. The research makes use of a process called thermionic energy converters that was first developed in the 1950s, and NASA and its counterpart in the Soviet Union at the time were exploring the idea to create high-power generators for deep-space missions. But the technology was never commercialized back then. The Stanford researchers say they have found a way to combine the thermionic process and the use of semiconductors, which are building blocks for solar cells, and create a device that works best in high temperatures. Traditional solar cells only make part of the light spectrum to generate electricity, and the process actually generates heat, which is considered a waste and can also threaten the performance of solar cells. Finding a way to harvest the heat could lead to a more efficient and robust solar electric system. The researchers first coated a piece of the semiconductor gallium-nitride (which can withstand high temperatures) with the metal cesium, but they didn’t achieve the high efficiency they wanted. The researchers are now looking at using other semiconductors, such as gallium-arsenide. A PETE device could have a higher efficiency than the theoretical maximum of roughly 30 percent for silicon and be comparable to the 41-42 percent triple-junction cells that have been developed in labs, the researchers say. Gallium-arsenide, incidentally, already is a key ingredient in triple-junction solar cells used by concentrating photovoltaic (CPV) developers, such as startup SolFocus. A CPV system uses mirrors to concentrate sun light hundreds of times onto solar cells, but it doesn’t use the heat. Instead, the systems have designs that dissipate the heat, so that it doesn’t cook the solar cells. The triple-junction cells used by CPV companies can make use of a broader light spectrum than silicon cells, so less of the sun’s energy becomes waste heat. The commercially-available triple-junction cells can hit close to 40 percent efficiency (under high concentration). Spectrolab has created a cell in the lab that could do 42 percent under high concentration. Both CPV and concentrating solar thermal technologies are both emerging technologies because neither has captured a big chunk of the solar energy market. SolFocus recently completed a 1-megawatt system at a community college in California, and that was the largest CPV power plant in the country. Solar thermal technology developers such as BrightSource Energy and Abengoa Solar have gigawatts of projects under development in California, Nevada and Arizona, but none has broken ground yet. Image courtesy of Nature Materials.